You're a GoPro user and use it to record real life amazing moments in HEVC format. You're a Bandicam user who is disposed to record gameplay videos and save them in HEVC format.You recently update your home video surveillance system to a Q-See 4K NVR with 4MP IP cameras. The system encodes everything in H.265 (HEVC). HEVC is great, high efficiency in video compression and high standard in video quality. Yet, nothing is flawless. When it comes to HEVC video upload and playback, the problems of HEVC video are peeking over the horizon. 1. The GoPro H265/HEVC file is too long to upload to YouTube, longer than 15 minutes. 2. It will cost too much time for uploading Bandicam 1080p video since it reaches 270MB for only 90s (2.64GB for 15-minute length), too large in size. 3. The recorded videos from NTR are encoded by HEVC in .avi file extension, which cannot be supported by your QuickTime player and Final Cut Pro. Faced with such cases, what you need is an HEVC editor to help you edit HEVC/H265 files e.g., trim HEVC video length within 15 minutes, reduce HEVC video file size for faster uploading, lower HEVC resolution from 4K to 1080p, as well as encode HEVC/H265 from AVI to MP4 for better compatibility and more. Well, need any suggestion? If so, please have a look on the beow recommended HEVC editor software. We would feel very glad if they can indeed satisfy what you need. Don't be confused by the product name. Though it's called video converter pro, actually it plays the role of a mac video editor, as well. Just as the above picture shows, this HEVC editor has the power to help you trim HEVC/H265 files via free Start/End time settings so that your lengthy video can be shortened within YouTube required 15 minutes. Given that the maximum YouTube upload size is 128GB, your common HEVC files can't exceed this range. Hence, file size won't be an impediment to HEVC YouTube upload. The reason you prefer smaller file size is mainly related to bandwidth comsumption and time loss. The larger HEVC file, the more time you spend. Well, to reduce HEVC file size, take advantage of the "Setting" features to properly lower 4K HEVC resolution to 1080p or 720p, turn down frame rate from 60fps to 30fps or 23.97fps. Of course, both "Trim" and "Crop" features under "Edit" option are also the nice choice for you to properly shrink HEVC (H265) file size. For NTR users, don't forget that it's an HEVC video converter. Therefore, needless to look somewhere else, you can just utilize it to decode HEVC/H265 videos in .avi format to H264/MPEG-4 in .mp4 format and then import HEVC 4K or 1080p video to QuickTime, Final Cut Pro, iMovie for playback or editing on macOS. 1. 3-in-1 HEVC 4K editor: edit, encode and record HEVC videos with highest possible quality. 2. Easy for beginners to edit H265 videos and adjust HEVC parameters. 3. Up to 320+ video and 52+ audio codecs supported, encode any video to HEVC codec and decode HEVC to H264, MPEG-4, MP4 any format. 1. Compatible with macOS. Download Windows version if you are running on Windows PC. 2. Only basic HEVC 4K video editing features. No filter, special effects available now. Price: $29.95 for 1 year license; $39.95 for lifetime license. Compared with the first H265 editor tool, this one is obviously more professional and meanwhile more complicated (interface tells all). Usually, some Hollywood pros are disposed to use it to edit videos, TV shows, commercial ads and some movie trailers. Because it's not just a basic video editor to let you remove some HEVC video clips, cut off HEVC video frames, but also support you to adjust video colors, add special effects (filters, rendering, transition, etc. ), polish your video soundtracks, import video subtitles, etc. Its video editing features are really awesome. Meanwhile, its video compatibility also makes you thumb up. No matter what you have, 4K HEVC or 360°/VR video, it can accept any video file that you feed it and export the completed video to a wide library of standard formats. Thus, you can eventually upload your HEVC creative video to YouTube, Vimeo, Facebook or Twitter for sharing. Of course, this Adobe HEVC editor is not perfect, either. Where it still needs to improve is the video parameter adjustment feature like the common 4K 2160p to 1080p, 1080p to 720p, aspect ratio change, frame rate conversion, audio channel adjustment, etc. 1. 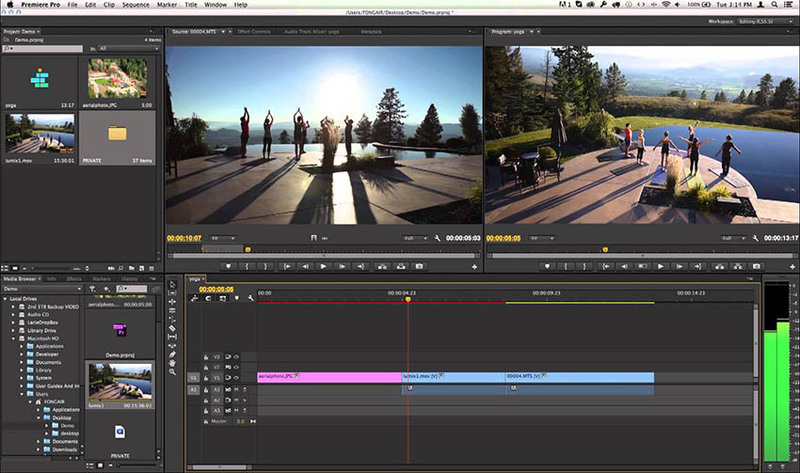 Comprehensive features for pro users to edit HEVC with a full range of special effects. 2. Support a wide selection of video formats, up to 8K and virtual reality video. 1. Interface is filled with too many features, not so intuitive. A little bit complicated for the beginner. 2. Sometimes work slowly or crash at half. Worse still, it charges high, $19.99 per month. MacX Video Converter Pro, whose powerful ability enables you to copy HEVC video audio codecs from AVI to MP4 container without quality loss. And it also helps you shorten HEVC video length, adjust MP4 parameter settings (resolution, frame rate, bit rate, etc.) and download online HEVC/H265 video movie for watching offline on iPhone iPad.